Ken Olsen is not just growing delicious oranges and mandarins; he’s growing a healthy ecosystem. “It’s like paradise here,” the citrus farmer says of Olsen Organic Farm in Lindsay, 180 miles southeast of the Ferry Plaza Farmers Market. While conventional citrus farmers rely on chemical fertilizers and pesticides to maintain large, monocultural orchards, Ken sees his organic farming practices as an extension of his reverence for the natural world. It’s a wild oasis that took years of patient and persistent sustainable land management to achieve. After a career in construction, Ken took an early retirement to pursue his dream of citrus farming. He inherited a green thumb from his Danish immigrant parents, but he had no experience growing commercially. “They had traditions for how they took care of their garden and animals, so I had an idea of what organic farming was,” he says. In 1996, he purchased 20 acres in the foothills of the Sierra Nevada Mountains, an area famous for its citrus production. 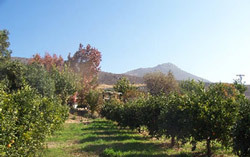 With warm days, cool nights, and protection from damaging frosts, the area’s unique microclimate makes it especially well-suited to growing mandarins and other fruits in the winter. The weeds competed with the cover crop, but he kept planting, mowing, and adding compost. After about 10 years, he saw signs of life: the soil was healing. He now describes his orchards as a polyculture, a style of intensive farming that mimics the diversity of natural ecosystems. While there are still plenty of weeds, they don’t bother Ken, and the mix seems to have an overall beneficial effect in his orchards. The farm is also home to hawks, gulls, owls, roadrunners, coyotes, rabbits, rattlesnakes (who keep rodent populations in check), and other wildlife. Even gophers play their part in this thriving ecosystem by aerating the soil, which helps water permeate down to the tree roots. Even though the farm is positioned on a hill, the cover crop and soil organic matter soak up the water so there is no irrigation runoff. Ken has eschewed organic fertilizers and says that the only input he adds to the soil is aged compost. “I used to use all the silver bullets they advertise in organic agriculture, like NPK and zinc, but I don’t need those anymore. I have the soil food web at work,” he says proudly. Fertile soil helps ensure peak flavor in Olsen Organic’s citrus, as does allowing the fruit to develop fully before it is picked. In contrast to citrus from large conventional growers, who harvest the fruits before they’ve ripened and keep them in cold storage until ready to ship, Ken’s fruit is harvested ripe and usually makes it to market within a couple days. His small but experienced crew tends the orchards and picks and packs the fruit by hand each week. 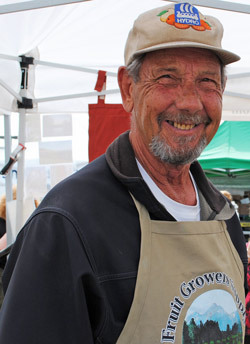 You can find Olsen Organic Farm at the Ferry Plaza Farmers Market on Saturdays from November through April. 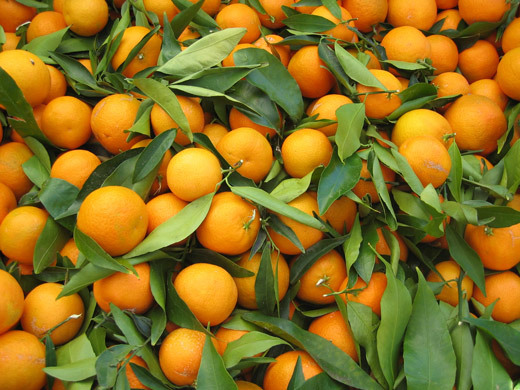 For a full list of farms that grow citrus, see our Guide to Citrus Fruits.